I did a favor for a writer friend recently, reading her manuscript and writing a blurb for her publisher. It was an easy favor to do– I’d enjoyed her earlier book, a collection of essays called Because I Love Her, and expected I’d like the new one, which I really did. 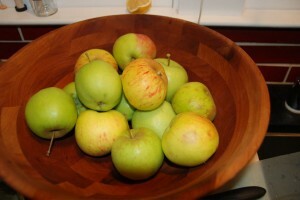 So when we met up for a movie sometime after I’d finished, I was completely surprised and delighted to receive a shopping bag full of apples from her tree. Preheat the oven to 350 and butter a 13×9 baking pan. Add the flour mixture to the butter mixture in 3 parts, alternating with the yogurt mixture, stirring until smooth. Scrape the batter into the pan and spread evenly. 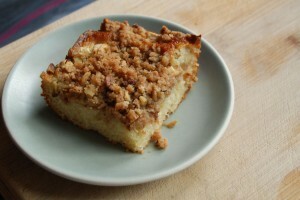 Top the batter with 2 1/2 cups diced, peeled apples, and then the streusel topping. Bake for 40 to 45 minutes, until a toothpick inserted in the center comes out clean. Yum! 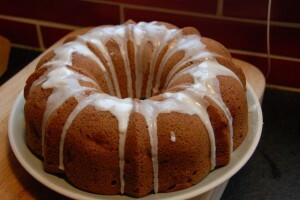 I made the white moosewood bundt cake recently but I didn’t have any brown sugar, so subbed white sugar plus molasses. 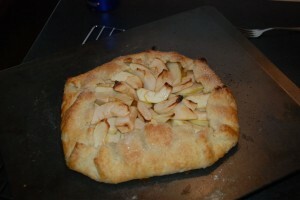 It took a lot longer to bake, but it was phenomenal–I’m not sure I’ll ever do it another way again!